The threads in an overlocker are, in my opinion, by far the most daunting aspect. So daunting in fact that I decided to cover them in two seperate blog posts. Today, I'm going to be talking about how to set up the threads at the start, which thread to use, how often to change the thread etc, but keep an eye out for lots more overlocking thread goodness very soon! So, first of all, what are all the threads for and what do they do? Most overlockers have three or four threads (although two and five thread overlockers do also exist). Four thread overlockers are best for sewing with heavier, more durable fabrics, as they produce a stronger seam. Three thread overlocking isn't as strong as overlocking with four threads but it's less bulky so is good for sewing with lighter-weight and more delicate fabrics. You can easily convert a four thread overlocker into a three thread one, simply by leaving one of the needles unthreaded. For a wider seam, leave the right needle unthreaded and for a narrower seam leave the left one unthreaded. I'm not going to cover threading the machine from scratch as a) we'd be here all day and b) there are lots of good sources already avaliable. Luckily, overlockers don't actually need to be threaded from scratch very often. Personally, I found this video quite helpful for and if you have a copy of Stretch! 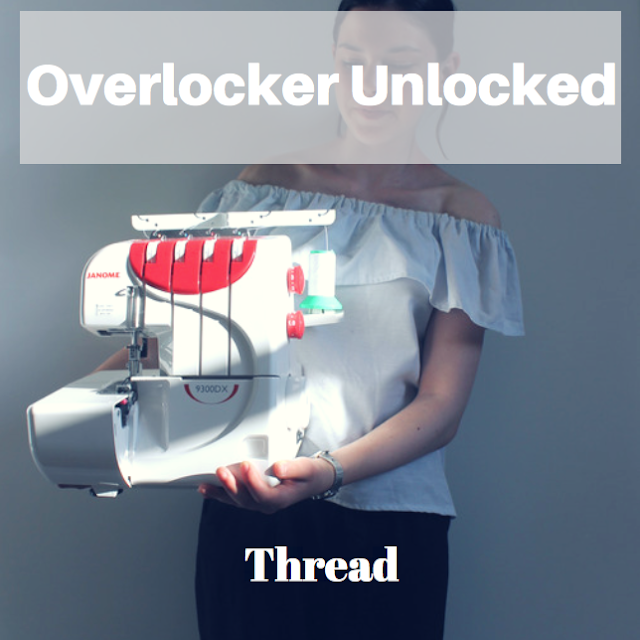 there is a great section all about threading your overlocker. Fortunately most overlockers have a colour-coded diagram printed on them (like the one above) which is really helpful to help get your head around all the different threads. What equiptment do you need? You don't really need any equipment to help you thread an overlocker (except for thread of course) but you can purchase fine pointed tweezers to help pull the threads through. I don't actually own a pair of these but they would have certainly made my life a lot easier! The main thing you need - and this is essential - is patience. To begin with, it took me an absolute age to thread my overlocker. I promise it gets easier though, and you will find that with time it also becomes much faster. The main thing is to not give up and not throw your overlocker out of the window, something that crossed my mind several times during the painfully long and failing attemps. 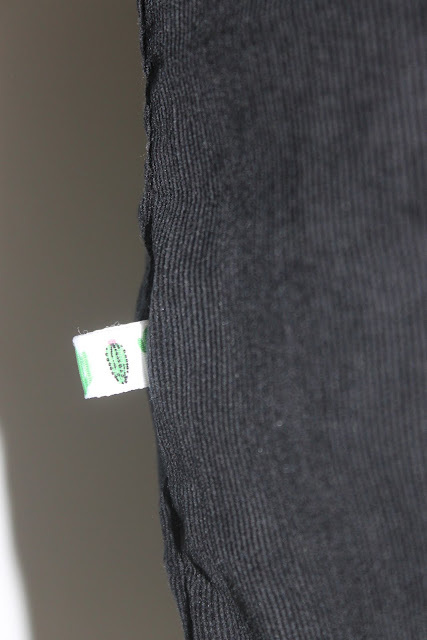 I'm going to cover a quick and easy way to change the overlocker thread in another post, so look out for that. One of the great things about overlocking is that you can't see it: it's hidden away inside the garment. Because of this, the colour thread you use doesn't have to match the fabric you're sewing with exactly. Due to the fact that you need four threads, it will get used up fairly quickly too so it's much cheaper to have a few spools of the colours that you sew with most often rather than buying new colours to match every project. I'd recommend having black and white, but navy, grey and cream are also common colours that you might find helpful to have. Of course, if you're sewing with a sheer farbic then you may want to buy thread to match that colour exactly but as a general rule I'd say that 2-4 different colours are the way to go. How often should you change the thread? As aforementioned you absolutely don't have to change the thread with every project. I only actaully black and white thread and while I don't mind which one I use so much on woven fabrics, I like to use the closest match (in my case either light or dark) when sewing with knit fabrics. I'd say that it's most important to change colour thread if you are working with sheer fabric or on a garment where you particularly care about what the inside looks like. There are two key rules to buying thread: quality and quantity. Quantity because overlocking thread gets used up very quickly and quality because there is nothing more anoying than thread that snaps continuously. It's best to buy your thread in cones and in bulk. I actually bought 4x5000 yards times two as I bought two different colours. That's 40,000 yards (36,576 metres) something that I still can't quite believe but at least I know that it will last me a long time! I bought this thread from Jaycotts, and I find that not only is it great quality but the colour is good too. Phew! That was quite a lot! I hope you found this helpful. You can find the other posts in the series here. I've mentioned it so many times before but pyjamas are one of my favourite things to sew when I just want a quick and easy project. I recently made my sister a pair of pyjama shorts, and they appear to have been an instant success (another thing I love about pyjamas: they get so much wear!) so she asked me to sew her another pair for the summer. You might remember these shorts that I made her last year - unfortunately, she has now grown out of them. While disappointing because the fabric is so lovely it was to be expected and it also gave me the perfect opportunity to make her another pair! The fabric that I used for these is very similar to that of the other pair, which isn't surprising as it's from the same shop. I first discovered Petit Pan when I visited Paris last year, and I immediately loved all of their prints. They're printed onto lovely quality cotton fabrics and they also have a great selection of waxed cottons. Luckily my mum and sister both really like their designs too, so it gave me the perfect excuse to sew with some of the fabric when my sister found some that she liked when she recently re-visited the shop. Petit Pan also have an online shop and I think they have at least one branch in the UK, so I would highly recommend having a look. As usual I used the Tilly and the Buttons Margot Pyjamas, which just seem to fit really well. They are also very simple to sew. I really need to make myself a pair and am rather sad to part with these lovely shorts! They have already had a lot of wear though, probably because we are currently mid-heatwave. As I mentioned Petit Pan also have a selection of waxed cottons, most of which are available in pre-cut sizes. I realised that I never shared this fabric basket that I made for my Mum and thought that while on the subject of Petit Pan fabric it would be nice to mention it. Fabric baskets are so simple to make and also perfect for gifts, I made this to give to my Mum alongside her embroidery hoop at Christmas. I love the pink fabric especially with the contrast of the dark grey and the piping was a perfect addition! My mustard Linden sweatshirt is one of my favourite makes. I knew as soon as I finished it that another one would be imminent, and to be honest I'm surprised that it has taken me this long to make another! I love the bright mustard colour but decided to make one which was slightly easier to wear with a wider variety of things this time, and I thought of the Linden almost immediately when I saw this fabric in Higgs and Higgs. As I said, I wanted to make a Linden which was slightly more versatile than my previous one. However, I didn't want it to be boring, especially as recently I've been trying to sew more basics which have a slight twist in them. If you read about my plan for this fabric when I bought it you'll remember that I chose a pale pink ribbing to contrast the light grey. Well, that's exactly what I did, and I love it! It was such an easy addition with a contrast neckband and an additional band at the sleeve hem but I think it really transforms the top. The fabric itself is also really lovely and special in that it has a really interesting texture. 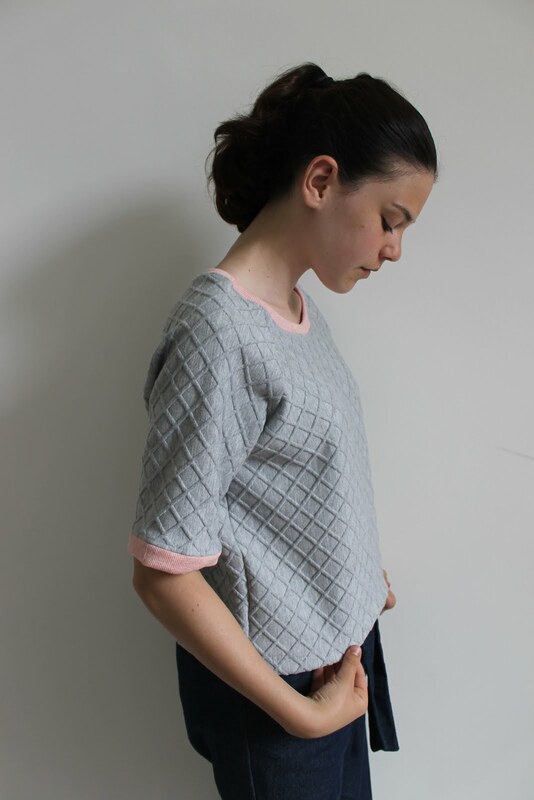 I love finding knits that are more interesting than typical and Higgs and Higgs has got some great textured knits. This fabric is actually the same as the one that I made my Mum's Stella hoodie out of, only the pattern is slightly different. Although the fabrics are different I'm sure we won't be wearing our tops at the same time! I think the fact that we both picked this fabric goes to show how gorgeous it is. It's no secret that I love the Linden sweatshirt. I've made so many, both for me (here, here) and for my Mum (here, here). I love how they all look completely different depending on the variation and fabric used. View B, which is the view I used for my mustard linden and for this one, is my favourite though. I think that the style lines show particularly well in a heavier weight fabric and I love the curved hem which is higher at the front than the back. 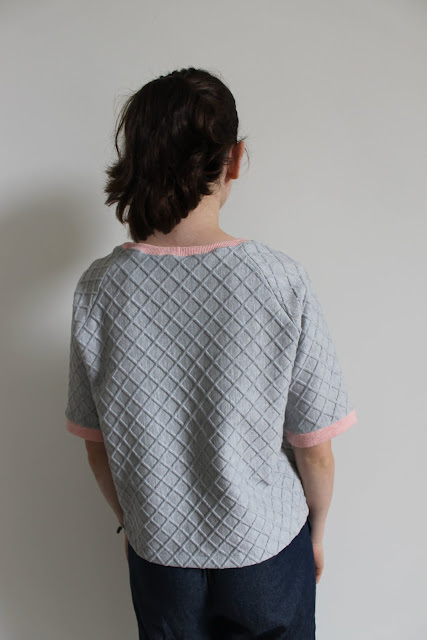 The proportions are just right too: I very rarely use the original pattern length for hems but the suggested length and sleeve length is just perfect for me on this view of the Linden. Despite already owning two Tilly and the Buttons Cleo dungaree dresses I knew that I had to make a third when I saw this gorgeous midnight black needle cord from Minerva Crafts. I love needle cord fabric, and was not disappointed with this one when it arrived: not only is the colour a lovely deep black, but it also feels wonderful and the cord is lovely and fine. As aforementioned I made a Cleo dungaree dress with this fabric, and I could not be more happy with the result! I actually already own a needle cord Cleo, (and a denim one) but I think that this one is different enough for them to both be worn often. I’ve sewn using needle cord before and although it is fairly easy to sew with I would stress that the fabric does become squished if it is ironed. Because of this, I ironed my fabric with a tea-towel over it to protect it at the start, and then tried not to press it too much as I sewed. Luckily, I’ve found that the creases drop out of the fabric when it is hung up. I really enjoyed sewing this for several reasons. The first is that the pattern is just so simple! By now I have the pattern traced out and I know exactly how to sew it which made it an even speedier process. This fabric was also really nice to work with. What I like about sewing something with a pattern that I have used before is the knowledge that I will get a lot of wear out of it, as there is nothing worse than spending lots of time sewing something only to never wear it! It was a really relaxing and satisfying sew. 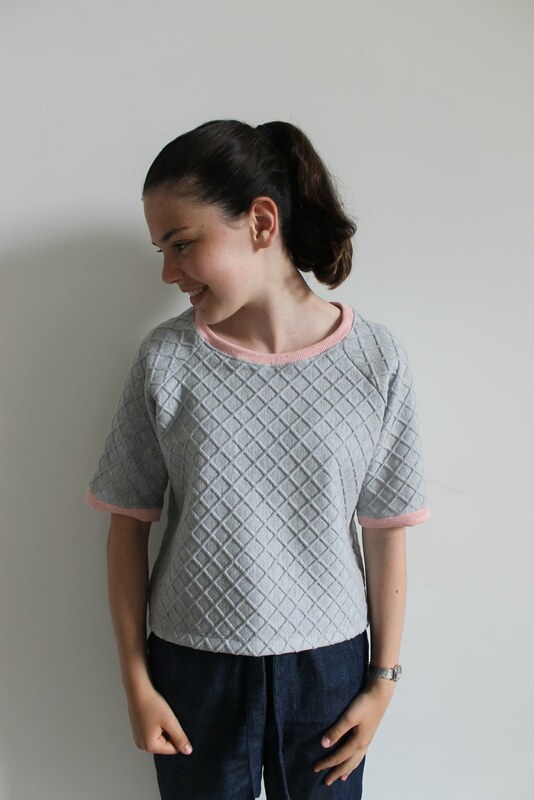 It’s also the perfect pattern for beginners and great to sew out of a needle cord fabric such as this one. 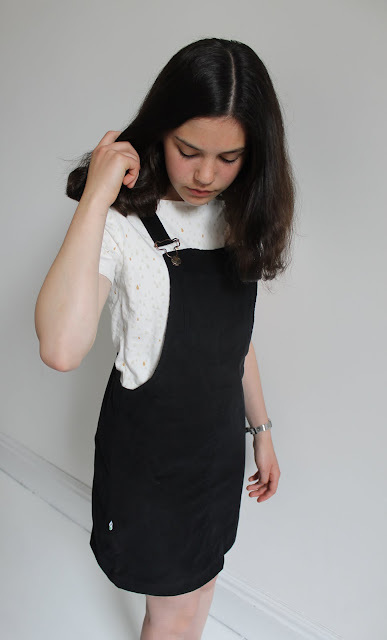 I mentioned some of my favourite patterns to sew out of needle cord in this post, and as you can see the Cleo dress was one of them. A special detail that I love is this tiny snippet of cactus ribbon that I enclosed in the side seam. 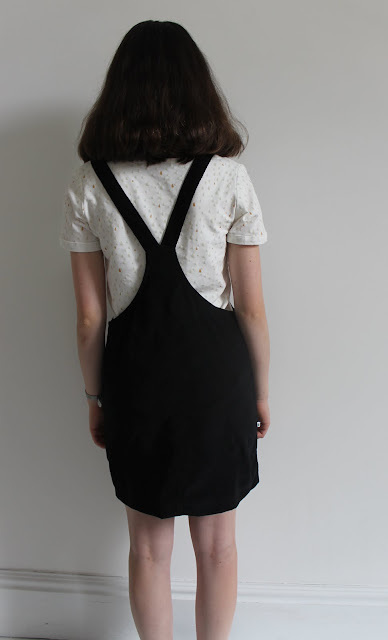 It’s really small so doesn’t disrupt the dress of make it hard to wear but its so cute and makes me smile every time I see it.Another thing that I like about this particular dress is the dungaree clips. I’ve only ever found silver ones before but my Mum managed to find the lovely brass ones that I decided to use on this dress. I absolutely love the copper colour with the black! 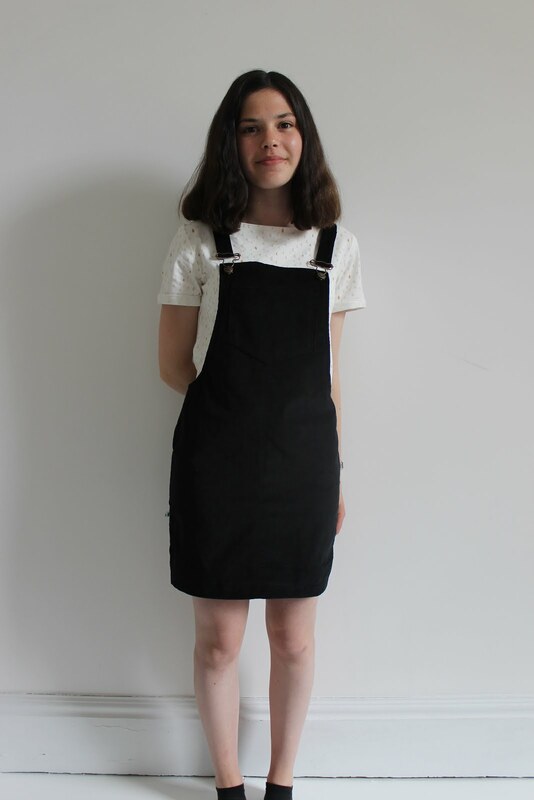 I really love the versatility of the Cleo dungaree dress. I wear mine all the time, and I’m sure that this one will be getting a lot of wear too! I’m sure it’ll be great throughout all seasons too as it can be worn with/without tights, jumpers, t-shirts etc. Although black could seam like a fairly dull colour, I would argue that it’s perfect for a layering piece. I like that it means that I can wear most tops underneath it, I currently love wearing a white top underneath – the contrast between the colours looks really nice. I don’t own any really bright tops but they would look great paired with this dungaree dress too. Another thing to add to the sewing list perhaps?! I also really like this shade of black: it has a lot more depth in it than some grey/black fabrics do. Sometimes, fabric is just too good to be left behind. And when I spotted this very cool viscose/georgette/poly-mix fabric at Fabric Land I decided to risk it and buy a metre. I wanted to make a pair of trousers as soon as I saw the fabric but becasue it's quite bright I wasn't sure that I would wear them. However, because the fabric was so cheap I bought some anyway. 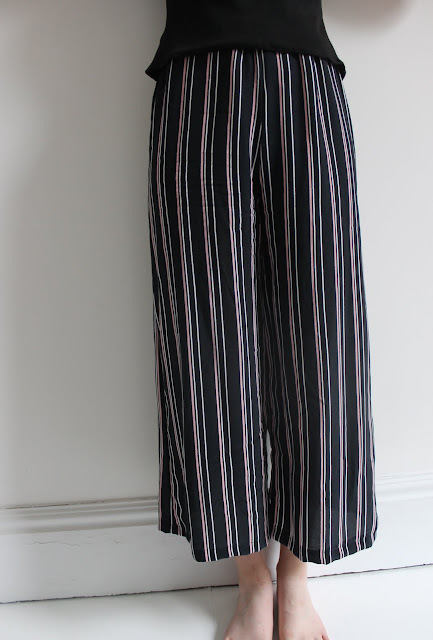 I wanted to have a go at drafting a pattern and decided that if the worst came to the worst they would be a good experiment, but as it is it was a risk that absoluteley paid off because I love these trousers! There was no question about it: the trousers had to be cropped, and they had to be wide. I decided on the cropped length for several reasons. 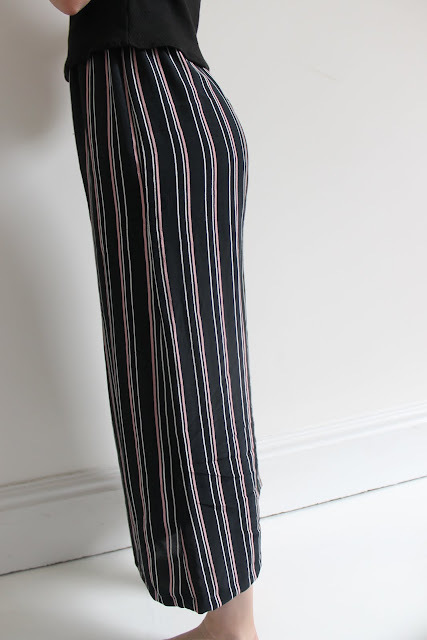 The first being that I love cropped trousers at the moment, and the second was because I know that I would never wear a pair of long wide legged trousers. Also, the stripe pattern would have probably been too much had they been full length as it is quite a full on pattern. As for the width, wide legged trousers/ culottes are another design that I currently love (see here) and beacuse the fabric drapes so nicely it was ideal for this design. I sewed the trousers entirely with french seams, which is probably my favourite way of finishing seams. Despite the fact that the fabric doesn't feel the nicest as it's a blend, the french seams make the trousers feel more luxurious and also stop the seams form fraying. The fabric was quite difficult to photograph but hopefully you can see it fine, it's a black with pale pink and white stripes on it and I really like the pattern. I love these trousers so much and so much more than I thought I would too. 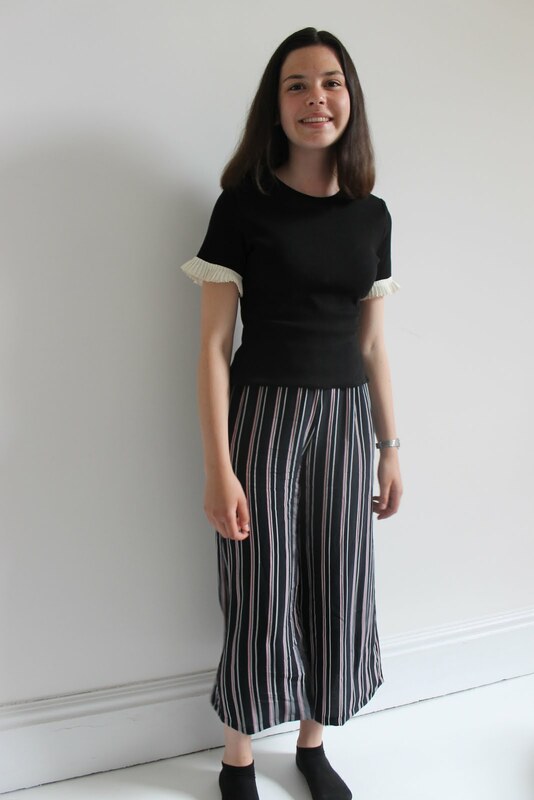 Although the fabric is a bit out of my comfort zone I think they're really wearable (much more so than my marigold trousers) and I especially like them with my black top. For the pattern, I decided to hack the Margot pyjamas from Love at First Stitch. It was really easy to do, I simply widened and shortened the legs. 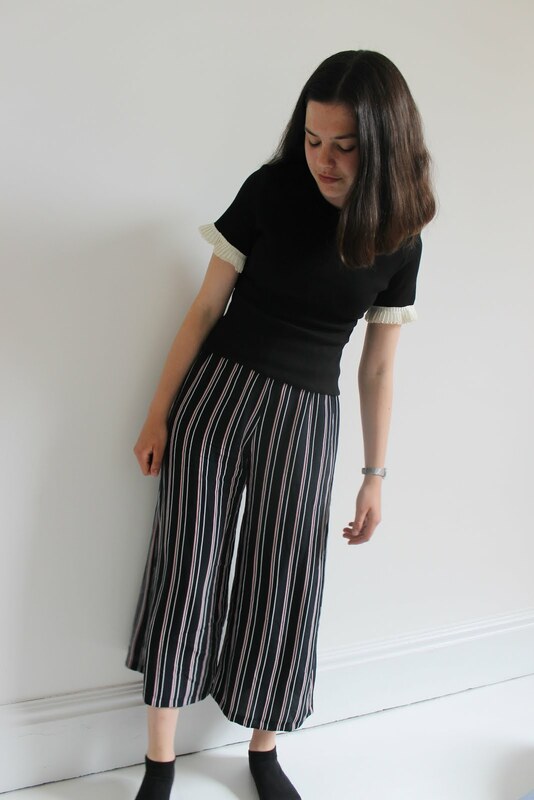 I also used the Margot as a base when I made these trousers, which goes to show how different two variations of the same pattern (albeit with quite a bit of pattern hacking) can look.